Android One has affected many Android fans in India. However, Karbonn launched its latest Android device titanium S5 Ultra Follow the Android One. Its price is Rs 6,999 and it is available for sale on e-commerce site, eBay. This phone comes with IPS qHD 5 inches capacitive touchscreen display with resolution 960×540 pixels. It powered by Quad-core 1.3GHz processor with 1GB RAM. 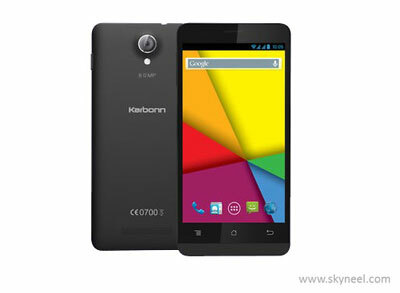 Karbonn Titanium S5 Ultra is a Smartphone phone which is available in Dual SIM with 3G facility. The Karbonn Titanium S5 Ultra available in Black color. This phone comes with Quad-core 1.3GHz processor with GPU Mali 400. It has 8 MP with auto focus on rear and 2MP front camera. Karbonn Titanium S5-Ultra has 1.3GHz Quad-core processor. This phone may prove excellent in multitasking as it has 1GB RAM too. Karbonn Titanium S5 Ultra has Mali 400 GPU. Karbonn Titanium S5 Ultra has 1GB RAM with 4GB ROM and user can expand memory up to 32GB via SD Card. The Karbonn Titanium S5-Ultra runs on 4.4.2 Android KitKat. It supports Java and browser flash. The Smartphone has an Accelerometer, proximity and Maps, Calendar, Google Search, Gmail, YouTube, Google Talk, Alarm, Calculator, Clock, and other Google sync apps. The S5 Ultra supports 3G and 2G (GSM) networks. This phone has Wi-Fi, Bluetooth, GPRS and EGPRS or EDGE, with 2000mAh Li-lon battery. 1. High speed Quad-core 1.3GHz processor. 2. Decent Screen size with good resolution. 2. Doesn’t have a compass.